Life in a small space can, in a nutshell, feel like… well, living in a nutshell. Apartments and condos, though cozy and charming, aren’t always the most functional, and they’re certainly not conducive to sprawl. 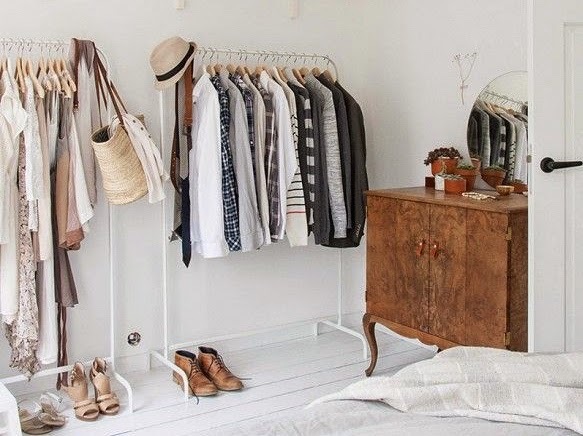 Linen closets, pantries and indoor storage rooms are luxuries not typically included on the list of apartment amenities. To comfortably inhabit such a space, it’s essential to take advantage of every nook and cranny. Here are a few tips on how to do just that without breaking the bank. Or a fingernail. When square footage and floor space are lacking, it’s time to aim higher. Incorporating shelving of any kind can be a game changer in even the smallest space. Think outside the box a little. Consider shelving around a kitchen doorway if you lack a pantry, or fill a blank wall with open shelving to display cookbooks and your prettiest dishes. As English textile designer William Morris so simply and eloquently put it, “Have nothing in your house that you do not know to be useful, or believe to be beautiful.” If you don’t need it or you have no idea what you’ll do with it, don’t buy it (even if it’s on sale.) What’s more, dedicate yourself to regular closet and cabinet purges. If you haven’t given it a thought in a year, toss it out or donate it. A coffee table that conceals blankets can free up space and avoid visual clutter in the living room, a bed high enough to house a row of sturdy baskets can solve your lacking a linen closet, and a stool in the living room can play a role of both accent table and extra guest seating. Bring the outdoors in with freshly cut flowers, potted plants, a few succulents or air plants. Whether you have a green thumb or a black one, there’s bound to be a sort of plant species that can survive on your coffee table. Incorporating a little nature indoors brings in natural color, and with it unavoidable sunshine and cheer.